2016 has delivered its fair share of commodity market surprises. But none have been more unexpected than the sharp recovery in coal prices. European benchmark ARA coal prices have increased by more than two thirds since January, from below 45 $/t to more than 75 $/t. This coal price rally has been the principal driver behind the pronounced rally in European power prices since Q1 2016. While coal prices have increased sharply, European gas prices have remained relatively weak, supporting a competitive shift across Europe towards gas-fired generation. 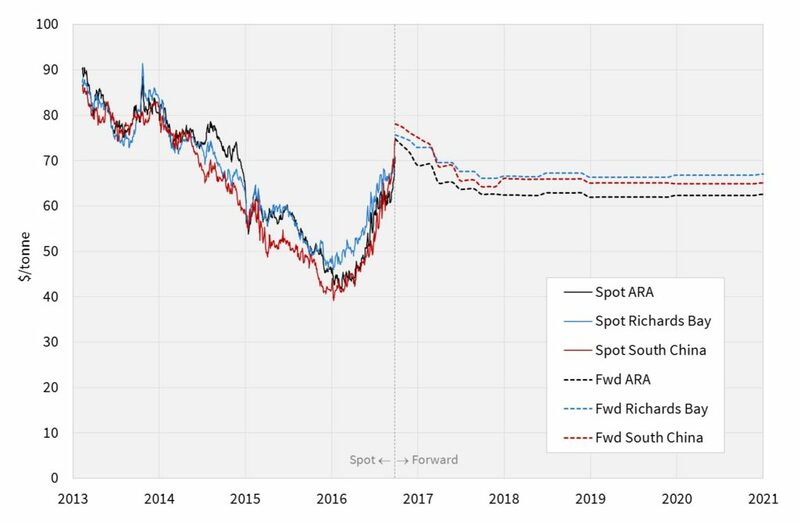 In this article we take a look at the drivers behind the rally, the shape of the current coal forward curve and some implications for European gas and power markets. What is behind the rally? Some important context precedes this year’s recovery. Coal prices halved across 2014 and 2015 as shown in Chart 1. As is often the case with the coal market, events have been evolving around China. China experienced negative coal demand growth in 2014 and 2015, as economic growth slowed and government measures were implemented to reduce air pollution. Over the same period, growing domestic production overcapacity in China helped to aggravate a global supply glut. The sharp move higher in prices in 2016 has been supported by a reduction in production overcapacity on two fronts. Firstly, the Chinese government is taking measures to close 500 million tonnes of production capacity over the next 3-5 years (~15% decline). Secondly, lower prices have been driving a supply side market response from global producers in the form of mine closures and mothballing. As well as these more structural drivers, there are some shorter term factors behind the price rise. Heavy rain has temporarily disrupted production in some big producer countries (e.g. Indonesia & China). There has also been a big squeeze in the coking coal market as global steel production has recovered and this has fed through into thermal coal prices. As is often the case in commodity markets, the big spot price rally has dragged the coal forward curve higher. But Chart 1 also shows a strong current backwardation in the coal curve. This is consistent with market expectations that some of the shorter term constraints of 2016 will ease into next year. Despite current backwardation, coal prices for 2017 still remain around 65 $/t. The rally in the coal forward curve has supported a 40% rise in 2017 power prices in Germany, which broke back above the 30 €/MWh last week (from around 21 €/MWh in Q1 this year). Similar power price rises have occurred across other Continental European power markets where marginal pricing is dominated by coal plants (e.g. France, Netherlands). European gas hub prices on the other hand have remained relatively weak in 2016, held down by robust pipeline volumes and the global LNG glut. Up until 2016 coal and gas prices had declined in a correlated manner. But this year’s price divergence has sharply reduced the competitive advantage that coal-fired power plants have enjoyed over CCGTs for most of this decade. This relative change in gas plant competitiveness is having an important impact on the European gas market, as well as on power markets. Gas-for-coal plant switching is playing a key role in influencing marginal hub prices in Europe. The 2016 rise in coal prices has increased the gas price levels at which switching takes place. The gas price levels at which switching takes place are an important factor determining European hub price support, also influencing spot LNG prices (given their linkage to European hubs). For a given level of gas prices, a rise in coal prices increases gas demand from CCGTs. Or to look at it another way, if coal prices had not risen in 2016, lower gas price levels would likely have been required to induce the CCGT load factors required to absorb surplus hub gas. There may also be an important longer term impact of the recent reduction in coal plant competitiveness. Rising coal prices are materially eroding coal plant generation margins. This comes at a bad time for plant owners as it coincides with an increasing European policy shift against coal generation as efforts increase to tackle emissions. The 2016 coal price rally appears to be the nail in the coffin for most of the UK coal plant fleet, which is penalised by the additional burden of the carbon price floor. France looks to set to introduce a similar carbon penalty on its coal generators in 2017 which should induce a similar result. More broadly across Europe, accelerated coal plant closures are likely to be an important topic of discussion in utility boardrooms. If Europe wants to decarbonise, cheap gas and rising coal prices are making it easier.